Luis Posada Carriles, an anticommunist militant who popped up throughout Latin America over the past half-century, died recently. He won’t be missed. 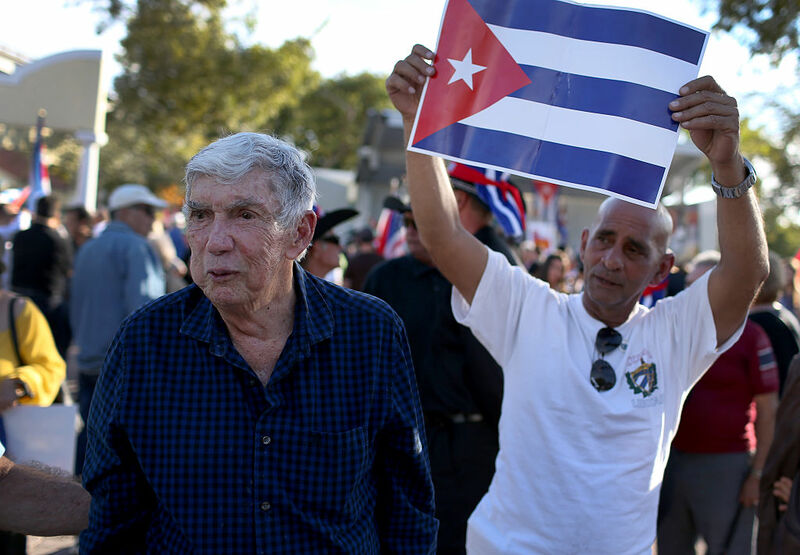 On May 23, Cuban anticommunist militant Luis Posada Carriles died at the age of ninety. No one on the Latin American left was in mourning. Posada is best known as one of the masterminds behind the 1976 bombing of Cubana flight 455 that killed seventy-three people, an attack against the socialist state in Cuba. Fidel Castro called him “the cruelest terrorist in the Western hemisphere.” But Posada’s CIA-financed career spanned several decades and multiple countries — including a lesser-known stint in El Salvador that placed him at the heart of one of the greatest scandals in recent US history: Iran Contra. It’s dizzying and dangerous to dive too far down the Iran-Contra rabbit hole. (Just ask Gary Webb.) A cursory look at Posada’s time in El Salvador, however, offers a hint of the staggering depravity achieved by the US government’s counterrevolutionary activities in Central America and provides an instructive reminder of the demons lurking just below the surface of the empire’s facade. Following the 1959 Cuban Revolution, Posada fled to the United States. There, eager to join the war against Castro, he joined the US army, receiving explosives training at the notorious School of the Americas in Fort Benning, Georgia, and rose to the rank of second lieutenant. According to agency records, Posada’s first contact with the CIA was in 1961, when he was recruited and trained for the failed Bay of Pigs invasion. He was commended by the Agency as “strongly anti-Communist” and deemed “of good character, very reliable, and security conscious.” Posada remained on the CIA payroll from 1965–1976. He spent several of those years in Venezuela, working in the state intelligence service. 1976 was a big year for Posada. CIA documents implicate him in the assassination of Orlando Letelier, the former foreign minister of Chilean president Salvador Allende, in Washington, D.C. Shortly thereafter, he was imprisoned in Venezuela for his role in the Cubana airline attack, the largest act of terrorism to strike the Americas. But Posada was connected, and the war on communism was calling. After several failed attempts, he escaped jail in 1985 with help from his Miami-funded network of anticommunist Cuban exiles, including fellow Bay of Pigs veteran and CIA operative Felix Rodríguez. They flew Posada to the Ilopango air base in El Salvador. In 1985, Ilopango was humming with activity. As the US Military Group in El Salvador supported the homicidal military regime’s counterinsurgency campaign against the leftist Farabundo Martí National Liberation Front (FMLN), CIA operatives were also using the base to clandestinely smuggle arms to the counterrevolutionary paramilitary forces fighting to overthrow the Sandinista government in Nicaragua — a practice expressly outlawed by the US Congress. A full-fledged CIA agent from 1967–1976, Rodriguez is best known for his role in the capture and execution of Ernesto “Che” Guevara in Bolivia in 1967. In El Salvador, he is also remembered for his part in the 1985 capture of FMLN guerrilla commander Nidia Díaz. Rodríguez was close friends with Donald Gregg, the national security advisor to then-vice president George H.W. Bush, having served together in Vietnam. Prior to North’s scheme, Rodriguez worked for Gregg, Bush, and CIA Director William Casey on Operation Black Eagle, another covert plot to smuggle arms to the Contras via airfields in El Salvador and Panama with help from the Israeli intelligence unit, the Mossad. As part of Black Eagle, Panamanian dictator Manuel Noriega collaborated with the operation in exchange for use of the planes to fly cocaine and marijuana into the US on behalf of the Medellín cartel. When North’s Enterprise started up, many of those drug flights were still passing through Ilopango. Rodríguez is also implicated in the 1985 kidnapping, torture, and murder of DEA agent Kiki Camarena in Mexico. Multiple former intelligence officials have come forward to attest that Rodríguez and Juan Mata Ballesteros, a drug trafficker also on CIA payroll, were selling narcotics for the Guadalajara Cartel and using portions of the profits to purchase arms and equipment for the Contras. When Camarena discovered the US government’s role in these illicit activities, the CIA ordered his assassination, then blamed the murder on cartel leader Caro Quintero. Rodríguez’s close relationship with Salvadoran air force commander General Juan Rafael Bustillo had been key to securing space at the Ilopango base for the Enterprise. A top official in the US-backed military regime, Bustillo oversaw some of the worst atrocities in a war characterized by hideous state violence: among other crimes, he is implicated in the 1981 Mozote massacre, as well as the 1989 murders of six Jesuit priests, their housekeeper, and her daughter at the Central American University (UCA). As he describes in a declassified 1992 FBI interview, Posada’s job was initially confined to logistics: he secured food, housing, and transport for the US supply personnel and fuel for the planes. Later, Posada began to coordinate the provision flights and manned the radio during missions into Nicaragua. By operation’s end, he had rented four houses and a small hotel that housed some thirty members of the project’s staff. The planes used by the Enterprise were provided by the Miami-based CIA-front company Southern Air Transport. Along with supplies, cash for the project was flown in from the US. The $10,000 cap on cash that could be carried out of the country per person proved a serious obstacle: “Any time any of the resupply people went up to the United States for any reason, whether it was a personal visit or whatever, they would be asked to bring money back,” Posada told the FBI. Fuel alone cost $20–50,000 each month, all of which went to General Bustillo. In fact, Bustillo sold the Enterprise fuel that had been donated to the Salvadoran military by the US government for its counterinsurgency war against the FMLN, securing enormous illicit profits. The pilots earned $4,500 a month, and everyone else got $3,000, plus an additional $750 per flight for all crew members. On top of this, Washington covered all living expenses. These funds, the world would later learn, were derived from illegal arms sales to Iran. The Enterprise operated well into 1986 and would have continued to do so had the Sandinistas not shot down one of the flights over Nicaragua on October 5. Former US marine Eugene Hasenfus, the pilot, was the crew’s only survivor. Captured by the Sandinistas, Hasenfus told the press that two of his colleagues, identified as “Max Gómez” and “Ramón Medina,” worked for the CIA. Medina, of course, was Posada Carriles’s alias; Gómez was Félix Rodríguez. These events blew the lid off what would soon become known as “Iran-Contra affair,” nearly taking down the entire Reagan presidency. The Enterprise quickly shut down. After the collapse of the Ilopango operation, Posada went on to advise the Salvadoran security forces in their ongoing scorched-earth campaigns to root out subversives. In 1990, he traveled to Guatemala to support the US-backed regime’s genocidal war there. After surviving an assassination attempt, Posada moved to Honduras. But Posada never abandoned his true passion: Cuba. He was behind a series of bombings in Havana in the late 1990s, and in 2000, he was arrested in Panama City with a car full of explosives — 200 pounds of dynamite and C-4 — that he had planned to use to assassinate Fidel Castro during a speech at the Inter-American Summit. Convicted in Panama in 2001, Posada’s connections prevailed again, and he was pardoned in 2004. After a short stay in Honduras, he entered the United States and applied for political asylum. CIA records are rife with concerns about Posada’s ties to organized crime and drug trafficking. Nevertheless, the Agency formally retained him for over a decade. Even as late as 1993, well after the notorious airline bombing, the CIA contacted Posada in Honduras to warn him of a plot against his life. Both Cuba and Venezuela requested Posada’s extradition from the United States multiple times, always to be rejected. In 2010, he went on trial for perjury, fraud, and obstruction for lying to US immigration authorities about his past; he was acquitted on all charges. Despite the trail of murder and mayhem Posada left throughout Central America and the Caribbean, he died a free man, harbored by the country that protected him for decades. As Peter Kornbluh of the National Security Archive’s Cuba project told the New York Times, Posada was a Frankenstein created and unleashed by the CIA itself. Posada was hardly a renegade, and his bloody crusade was no aberration; it was merely the unsavory underbelly of official US policy in the region. The damages wrought by US imperialist interventions in Central America in the name of capitalism and democracy are incalculable. In Nicaragua alone, over 40,000 lives were lost in the Contra war. The death toll from the conflict in El Salvador reached over 75,000, only 5 percent of which was attributed to the guerrillas. We are still reaping the devastating consequences of these campaigns, even as the US government promotes new forces of dictatorship and militarized neoliberalism in the region. Posada Carriles is dead, but the cause to which he dedicated his life lives on, as do many of his accomplices. As Feliz Rodríguez enjoys retirement in Miami, Oliver North has been resurrected to head the National Rifle Association. Until we dismantle the structures of capitalism and imperialism that they served, Posada and his kind will continue to haunt us.